ESRI Silverlight Map application project with a frosted glass theme, and pre-configured ArcGIS Online Maps. This VS extension installs a C# project template that can be used to create a Silverlight Mapping Application based on the ESRI ArcGIS Silverlight API. The ArcGIS API for Silverlight enables you to integrate ArcGIS Server and Bing Maps services and capabilities in a Silverlight application. You can create interactive and expressive applications leveraging ArcGIS Server and Bing Maps resources, such as maps, locators, and geoprocessing models, and Silverlight components, such as grids, tree views, and charts. This project template allows to create a mapping application with a frosted glass theme, and pre-configured ArcGIS Online Maps. 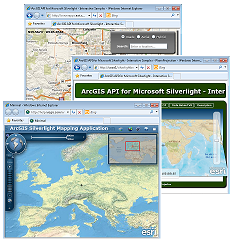 To use the template, you need to download and install the ArcGIS API for Silverlight. Alternatively you can get the ArcGIS API for Silverlight assemblies as NuGet packages.